Barry camp is operated by Fish and Game in partnership with 4-H through UNH Cooperative Extension. 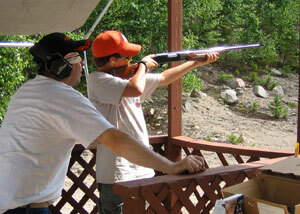 Programs include education in the shooting sports, hunting, fishing, camping and other outdoor skills. Barry Conservation Camp is in the White Mountain National Forest on the grounds of the Berlin Fish Hatchery. Visit the UNH 4-H website for specific session information and registration. Open to men and women age 18 and older. All proceeds benefit the Barry Camp Fund. Learn more about the Wild Game Culinary Adventure. 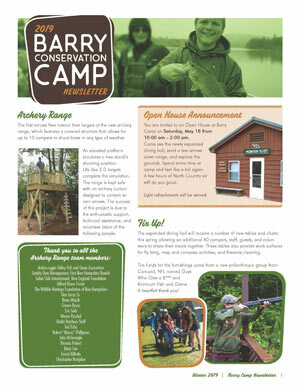 Thanks to widespread support from New Hampshire's outdoor community, Barry Camp is open today for our youth. The work is not yet done! Improvements continue, and we are working to build The Barry Camp Fund to ensure that New Hampshire's only true conservation camp will continue to be here to inspire future generations of conservationists and outdoor enthusiasts. This dedicated fund will keep Barry Camp viable into the future by providing the annual operation and maintenance costs. Please help if you can. their experiences at Barry Conservation Camp. How to Donate: Mail your donation to NH Fish and Game, or contribute online at nhwildlifeheritage.org or send your donation to: Wildlife Heritage Foundation of New Hampshire, P.O. Box 3993, Concord, NH 03302. Specify your gift is for "The Barry Camp Fund." Thank you! 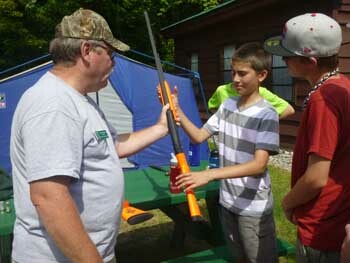 Capital improvements: Campers are enjoying a covered shooting range and pavilion built with donated materials and labor. Plans are in the works to build a covered screened-in programming area next to the dining hall, giving us additional dining capacity and space for small group instruction. Your donations to the Barry Camp Fund can secure the camp's future and help us make these and other improvements. Generous donors continue to make the project a reality. Learn how you can help. Barry Camp Memories - BCC has been a key experience for thousands of NH outdoorsmen and women. Can your club, organization or business help? Contact Mark Beauchesne at mark.beauchesne@wildlife.nh.gov or call (603) 271-6355. Directions: The hatchery and Barry Camp are at the end of York Pond Road, off Route 110 in Milan, NH. Mike Normandin of the Belknap County Sportsmen's Association is a volunteer who stepped forward to coordinate renovations at Barry Conservation Camp. He and fellow volunteer Gary Sleeper, who founded the Barry Camp Wild Game Culinary Adventure, are Barry Camp champions. 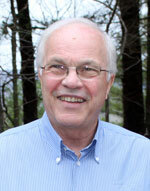 The NH Fish and Game Department is grateful for his vision and assistance. He received the NH Fish and Game Commission's highest honor -- the Ellis R. Hatch Jr. Award of Excellence -- in recognition of this outstanding effort.